It’s that magical time of year again. You know what I’m talking about…That’s right, it’s the time when all the seed catalogs start showing up in the mail. There are just so many amazing varieties of vegetables to pick for your garden. But you can’t grow them all, no matter how much you may want to. So how do you go about choosing the right vegetables to plant? Posts may contain affiliate links, which allow me to earn a commission at no extra cost to you. Your purchase through the links helps me create content like this post (full disclosure). Choosing the right vegetables to plant in your garden is not an easy choice for any gardener, but as a homesteader it can be even harder. Gardening is not just a hobby for you—as a homesteader, your garden may be key to your goal to be more self-sufficient. Even if gardening is more of a hobby, choosing the right vegetables to plant is still important since the wrong choices could cost you time and money that would be better spent growing those prize-winning tomatoes! Luckily, by working through the following questions, you can narrow down your vegetable choices. What vegetables do you and your family eat? What vegetables grow well in your area? What vegetables do you like to grow? Answering these 3 guiding questions will provide you a list of the best vegetables for your garden. To help you answer these questions, I’ve made a free, easy-to-print worksheet that you can fill out as you go through this post. I also made a special calculation tool called “Can I Plant it?” to help you figure out what plants will handle your growing season. Get yours now so you can choose the right vegetables to plant in your garden. This pasta dish was cooked up using fresh vegetables from a local CSA. I could grow all of these in my garden and I know my family would love them. Imagine your future garden filled with fresh, nourishing vegetables just waiting to be harvested. It’s the abundance you’ve always dreamed of. But no one in your family will eat them! Or worse—you barely know how to pronounce some of these veggies let alone cook with them. And alas, caught up in the demands of harvest season, you simply don’t have time to learn. So you end up giving away most of the produce you grew with your own hard work or watching it rot. I’ve heard far too many stories like this from gardeners. Let’s agree today that you won’t be adding your own story of wasted produce to the list. Figuring out which foods you already know how to cook, and your family already enjoys, is key to avoiding this problem. 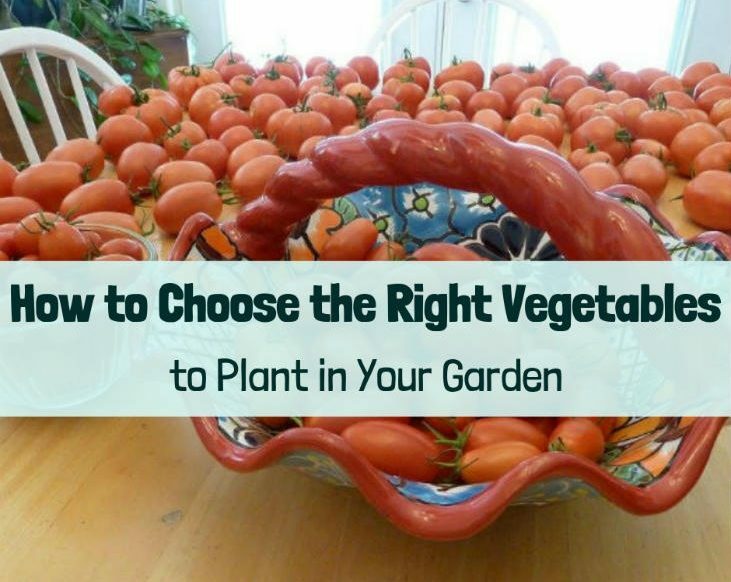 It’s the first step in choosing the right vegetables to plant. Ok, time to answer the question—What vegetables do you and your family eat? Think about what you eat raw (snap peas, lettuce, etc.) and what you cook with. What do you put in your main meals, and what do you serve on the side? Which ones do you put on sandwiches? What do you throw in soups? Do you use veggies in omelets or other breakfast foods? Don’t sweat it trying to come up with every last vegetable you use. This is just to get you a good starting list to help you decide the right vegetables for planting. Remember, during some parts of the season you’ll have a whole lot of one plant, and at other times you’ll have a whole lot of another. So be sure these are vegetables you can use regularly. The last thing anyone needs is a garden full of food that nobody wants to eat. Choosing the right vegetables to plant can result in a very nice and productive garden. Now that you have a list of vegetables that you and your family eat, the next step to choosing the right vegetables is to figure out which vegetables grow well in your area. Ok, I have a confession to make. I always try to keep information as straightforward as possible. But there really are no shortcuts to figuring out what grows well in your area—it’s actually a complicated process. I would really—REALLY—love to say this was easy but I’d only be setting you up for disaster. There’s a reason local food cultures developed through shared growing knowledge that was passed down from generation to generation. But for those of us that are trying to rebuild some of that knowledge from scratch, we’ve got a task in front of us. If you’re just getting started with gardening, you can always try out the most time-honored way of getting this information—word of mouth. Talk to your gardening friends and neighbors, or your local university agricultural extension office. Or visit the forums at permies.com where there is a great community that can help answer your questions. But if that’s not an option or you’re trying to move beyond the limited (or ill-suited) varieties your neighbors are growing, this strategy will help you choose the right vegetables to plant. This part of the puzzle involves looking at whether or not your climate will give each vegetable the time it needs to mature and produce a harvest. Every plant takes a certain number of days to mature. If this timeframe is longer than the growing season in your area, you are probably setting yourself up for trouble. While you can use various techniques like building a greenhouse or cold frame to create warm micro-climates (Check out the great book "Push the Zone" by David The Good to learn more about creating warm micro-climates) that buy you some time, sticking with your growing season is a safe bet if you want to keep things simple. Your growing season is the number of days between the last frost of spring and the first frost of fall. I cover this and other related concepts in more detail in my post on what to know before you start your homestead. But for right now, the National Gardening Association has a great tool that will tell you your growing season and first and last frost dates. Here are the results for my area using the above garden tool. Ultimately, the growing season is just a ballpark range. Some vegetables (like most leafy greens) do best in the relatively cool spring or fall weather, while other vegetables like beans and corn need the summer heat to take off. So lots of mild-weather plants should actually be planted before your growing season starts, while some sun-loving vegetables can’t be planted until after. For example, my last average frost date is May 5th. But beans and corn should be planted about a week later, around May 12th. Swish chard, on the other hand, can be planted as early as April 14th. Every vegetable is different, but luckily there are some general rules to follow. Leafy greens and root crops are usually the first up and enjoy milder spring weather. As the heat intensifies, that’s when it’s a good time for the brighter, juicier, sun-loving vegetables like tomatoes, corn and bell peppers. One of my favorite gardening YouTube channels, One Yard Revolution, has a great spreadsheet-based tool that you can download to figure out when to plant each vegetable. Just enter your last frost date in the tool and it will give you planting dates for 54 different vegetables. You can also use the tool to determine when to plant if you’re using season extenders like plastic row tunnels or cold frames. In order to eliminate all the plants that definitely will not grow in your area, you need to know the average days to maturity for each vegetable you listed in the previous section, and also the recommended planting date. You can get this info from the associated links or by looking at a seed catalog (online or print). The catalogs should list that info alongside each vegetable. You need to find out if a given plant will have enough time to mature in your area based on how early you can plant it and how long your growing season is. These are the kinds of drive-you-to-drink calculations that keep a lot of people from venturing out when it comes to choosing the right vegetables to plant. That’s why I made a vegetable calculation tool to make things easier. Just plug in the numbers and it will tell you if you have enough time to grow the plant in your area or not. You can access it from the worksheet and save yourself some headaches. Step 1: Determine your growing season and your first and last frost dates. Step 2: Look up the recommended planting date for each vegetable that you like to cook or eat. Step 3: While you’re at it, mark each of these vegetables as either hot weather or cool weather plants (You’ll need to know this for the next step). Step 4: Look up the days to maturity (online or from a seed catalog) for each vegetable. Step 5: Check to see if there are enough days starting on the recommended planting date (step 2) for each vegetable to reach maturity (step 4) before the first frost (step 1). Cross off any vegetables from your list that won’t have enough time to reach maturity. Whew! So now you know which vegetables can reach maturity before the first frost hits. Are we done yet? Oh, how I wish it were that simple… but I’m afraid it gets a little more complicated. Choosing the right vegetables to plant based on the steps in this post will help you grow more food regardless of how much space you have in your garden. This is a small patio garden from my old apartment. I said it before and I’ll say it again—vegetables can be picky! Not only do some veggies want to be planted before your growing season starts, some can’t go in the ground till after—knowing that you have enough time before the first frost is no guarantee that a plant will actually do well in your climate. Lots of mild-loving plants can’t handle the summer heat at all, whereas many sun-loving plants won’t reach maturity unless they have that hot sun beating down on them while they grow. If your growing season tends to be cool and wet, you may have a lot of trouble getting enough sunlight to ripen tomatoes, even if you technically have enough time. Unfortunately, there’s no clean mathematical calculation that will tell you whether or not a plant will thrive in your area (I don’t have a calculator for that!). But now that we’ve shortened the list, we can take a little more time to look at each plant to help you choose which vegetables to plant. Lot's of greens (lettuce, spinach, miners lettuce, etc.) prefer cooler temperatures and bolt or become less tasty in the summer heat. Knowing this lets you plan your garden and include greens like orach or Swish chard which can better handle the heat. Look at your list of vegetables. If you haven’t already marked your remaining plants as either hot weather or cool weather plants, (step 3 above) do it now. Think about how much of your growing season gets intense sunlight—especially toward the end. If the last few weeks before your first frost are wet and cloudy then vegetables that need hot weather are likely not going to produce a crop during this time. Are there any hot weather vegetables that won’t reach maturity until this time? If so, cross those off your list. My first frost isn’t until early October, but September tends to be cool and wet. We’re getting our last good tomato harvests in August, and by the end of September they’re starting to split and not look too great. At our homestead, we tend to seek out varieties like cherry tomatoes and other quick growing varieties that take the least time to produce a harvest. How do the last weeks of your growing season play out? Does your climate shift pretty quickly as you approach the first frost, or is it drawn out like mine? If the time it takes a vegetable to mature is pushing up against the end of your growing season, you might want to hedge your bets and cross it off your list. Of course one option with these hot weather plants is to start them indoors to get a jump start or buy starts instead of direct seeding. Think about your spring and autumn. How long does it take for your climate to shift gears into intense summer heat? If your area gets too hot during May and June, then cool weather vegetables (step 3) are likely to suffer or stop producing. Cross those off your list. This can be tricky. Spinach only takes 45-60 days to mature, but if your climate heats up too quickly, the plant will probably bolt before you get a good harvest. One way to work with this is to have some back-ups. Instead of banking on a fussy crop like spinach, for example, consider some more accommodating alternatives like Swiss chard, kale, or one of my new favorites—orach. Ultimately, the only way to learn what will truly grow well in your area is trial and error. Try out new vegetables gradually—and give them a few years’ trial, since weather patterns can change dramatically from one year to the next. Once you go through these steps, you will have a great list to help you choose the right vegetables to plant. But there is one more step that will make this list a little more fun. Snap peas are one of my favorite vegetables to grow. Here you can see a bunch on an old garden I grew while renting an apartment. So far, this post has been very focused on the practical side of choosing the right vegetables to plant in your garden. But where’s the fun in that? Gardening should be a labor of love, after all! Let’s make sure we’re going to enjoy gardening this year! That means spending our time, energy and money growing plants that we genuinely like to grow. For example, I absolutely love growing snap peas and cherry tomatoes. But I get really frustrated with spinach. I love spinach, but it’s way too finicky for my growing conditions and I just don’t want to waste any more headaches on it. I enjoy gardening more when I focus on the veggies that I love to grow, (alongside more accommodating greens than spinach). And I’ll probably end up growing a lot more food in the process! Take a look at your list of vegetables in the worksheet and star the vegetables that you really enjoy growing. Now cross out any vegetables that you just don’t like to grow. When you are making the final decisions and choosing the right vegetables to plant keep, these marks in mind. Make sure to plant some of the fun vegetables and avoid the ones you don’t like. Choosing the right vegetables to plant in your garden will result in a fun gardening experience and a lot of great harvests. If you’ve gone through each of these sections and used the free, easy-to-print worksheet, you now have a list of vegetables that you and your family will enjoy. You’ve found plants that grow well in your area, and best of all, you like to grow them! This list is your guide for choosing the right vegetables to plant in your garden. It should also give you an idea of which ones to prioritize as you move forward. If you marked tomatoes as a vegetable that grows in your area, you love to grow them, and you use a lot of them, then that is a great sign that you should grow lots of tomatoes! 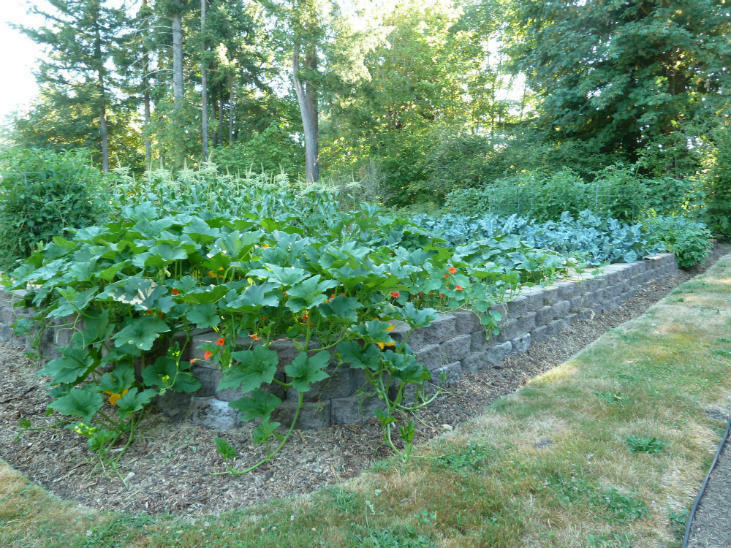 Grow lots of what you love, but keep in mind that planting a diversity of vegetables mixed together as a polyculture (rather than in uniform rows) will help you reduce your garden pest issues by working with nature. Also, don't forget about perennial vegetables which can be a great time saving addition to your garden. This list is also meant to be a safe list to choose the right vegetables to plant in your garden. Sometimes you can get lucky or use more advanced gardening techniques to grow vegetables that normally don’t do well in your area. There are 2 great books listed in the resource section that can help you expand what you can grow. Once you choose the right vegetables to plant in your garden, it’s time to start gardening. Here are some resources that will help you take your new list of wonderful vegetables and get them in your garden. Which vegetables are you going to plant in your garden? Leave your answer in the comments below and make sure to grab the free-easy-to-print worksheet that goes along with this post. This post was shared on the Homestead blog hop. Daron is the homesteader and blogger behind Wild Homesteading. With years of experience in gardening, permaculture, homesteading, and environmental restoration Daron's goal is to share his knowledge with all of you so you can work with nature to build your homestead and grow your own food. In addition, to running this site Daron is a restoration ecologist managing the restoration program for a local non-profit and a husband to an amazing wife who makes this site and the homestead possible and daddy to a perfect little boy. What a great and comprehensive article. I’m prepping for my large garden planting soon and we’re now whittling down what we’re going to plant this year. I can’t wait to see the fruits of our labor!